Here's the largest Feadship to join the market as Alex Lees-Buckley at Camper & Nicholsons signs the 75.5m motor yacht Ocean Victory for sale. Delivered by the De Vries yard in 2009, she was built to Lloyd's class and MCA compliancy under the supervision of Camper & Nicholsons. 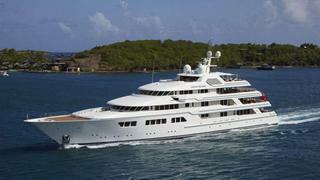 Accommodation is for 14 guests in six staterooms, all on the main deck, and the yacht has never been chartered. Ocean Victory features a full spa with sauna, hamam and a massage room and she has a touch-and-go helipad. The price of Ocean Victory is available on application.